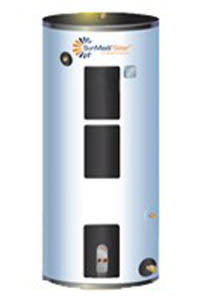 How Do You Properly Size The Storage Tank For A Solar Thermal System? What Is The Storage Tank For? The storage tank is meant to store up the thermal energy that was generated by the solar collectors during the day for use in the evening and following morning. Typically, the tank temperature will start out around the temperature from the mains water supply in the morning and rise to 140-160F late in afternoon (however, if the temperatures rise too far above this, corrosion can become a problem – corrosion doubles every 20F in temperature rise). After everyone has showered in the morning, your storage tank temperature will likely be down to right around the mains water temperature, and we will need a certain amount of energy to bring the temperature back up to 140-160F. This formula is a pretty safe rule of thumb that will serve you well in most cases (and does a good job balancing cost and longevity of the system). If you have a considerable draw during the day, then a lower volume can be used.